Baroque palaces, wide boulevards, and elegant bridges: St Petersburg. On May 16, 1703, Czar Peter the Great lays the foundation for the first building. Quickly impressive buildings are erected that are ever more grand and beautiful. Such buildings bring the aristocracy glory and the players victory points. But you need traders to bring the rubles necessary for all this magnificence, otherwise, the buildings are empty and bare. But the competition never sleeps and may grab needed cards right from under your nose. St Petersburg: the card game of beautiful living on the Neva. Also known as "Sankt Petersburg"
Wow!!! I must say that this is a wonderful game that grows slowly into you. Honestly, the box art is a bit plain but once you get into the game, it is another thing. This is a game with lots of strategy and yet simple in execution of rules. Plays very well with 2 or 4 players. This is an amazingly good game. It is fun, quick playing, and gives you a lot of strategic decisions. This is a great game! I love the challenge of keeping a fine balance of building income and acquiring buildings and nobles for points. It really can come down to just one or two rubles. Every time I play it I feel like I learn a little more depth about it. Can't wait to try the expansion! 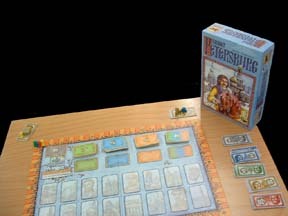 Saint Petersburg is a card based game for 2-4 players. Ok, I know, the box looks boring. But the game is fast paced and can get pretty intense. The game has great mechanics. For instance, each round has 4 phases but you can purchase or play cards from a different phase if they're still available. It plays quickly but you feel like you had a pretty full experience. A BGG top 100 game. Enjoy! Not our favorite game, but every time we pull it out and play it again, there's that flash of "oh yeah! This is a good one!" and we're happy we still have it. Not too complex, but enough that a little gaming experience would be helpful. Really nice for smaller groups, we've had fun with any number of players supported (2, 3, or 4). The great thing about Saint Petersburg is how the 4 phases of the game feel very different and still very linked. The key to success becomes managing the transition from one phase to another (i.e. ensuring enough money to keep expanding), which is something I have not seen in many games. Saint Petersburg feels innovate and taxing - and very rewarding, once you get the hang of the game flow. Along with Race for the Galaxy, this is my favorite card-tableau-building game! There is just something so satisfying about the simplicity of selecting one of the available cards to add to your stable of resources. While the game may be easy to pick up, there are lots of nuanced decisions to be made, and that's where you can be sneaky.... it's really a game of very small incremental gains to be able to pull out a victory in the end.